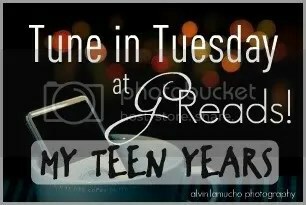 1998-1999 [Tune in Tuesday] – my books. my life. This is still my favorite Goo Goo Dolls song. When I hear it, I am instantly back in the fall of 1998. This one reminds me of my first job working at a 50s-style ice cream parlor. We listened to oldies when we were open, but come cleaning time, the poodle skirts came off and the dance party started. Admit it, you liked this one, too. And girls that wear Abercrombie & Fitch. What were you listening to in 10th grade? I loved all these songs too, but in the 10th grade, I was going through my retro phase and listening to a lot of Led Zeppelin, The Doors, and Jimi Hendrix. It was a fun time for me, and as I was starting high-school, I was beginning to find music that I had never been exposed to before. Lots of thanks to a few friends of mine for that! Haha, I loved LFO. And TLC of course! LMAO, I forgot all about LFO until you put the song up on your blog. It’s still such a funny cheesy song. I loved TLC too. As for Goo Goo Dolls, it wasn’t until I saw them perform live that I began to like them. It’s funny, because Blink 182 had the opposite effect on me. That’s really your favorite Goo Goo Dolls song?! Name is mine. It’s one of the few songs I can still hear today and love just as much as I did back then. Ah, the Goo Goo Dolls. I loved that album so hard, I nearly wore the CD out with all my repeat listenings. I think at least one song from this album appeared on all of my various mix tapes. Slide was one of my favourites, but Hate This Place took the prize for most listened to. I went through this phase where my favourite song on an album was always the last one. OH. MY. GOD. LFO. I TOTALLY forgot about them! I still quote that song (usually when someone brings up Abercrombie or Chinese Food), so terrible but so catchy. And hooray for No Scrubs, that was going to be on my list next week! I still jam to that song. I’m partial to Iris, but Slide really is a great song, too.